Google just updated their new user interface for tablet devices. 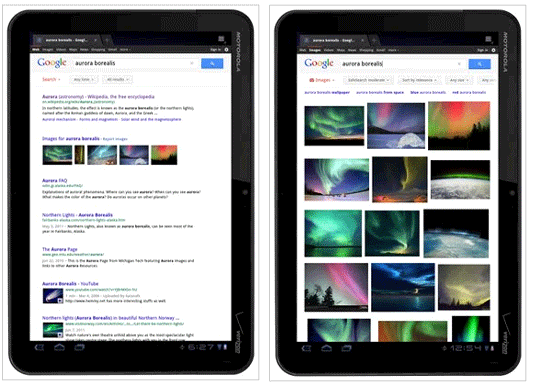 The new Google search engine design for tablets allows for a more roomy experience on tablet devices. Bigger buttons to touch, easier navigation across the tablet interface, and search results that are easier to transition through. As part of our effort to evolve the Google design and experience, we’ve improved thewww.google.com search experience on tablets. We’ve simplified the layout of search results pages and increased the size of page contents like text, buttons and other touch targets to make it faster and easier to browse and interact with search results in portrait or landscape view.